As a medical educator (of sorts) I have been following the #AMEE2016 feed with interest and some sadness. An International Association for Medical Education is meeting in Barcelona to share ideas and inspire educators. There are so many great ideas but clearly some dreadful presentations. And that both confuses and disappoints me. Surely, people with a heart and a passion for education should know this stuff? Surely we should have moved beyond Death by Powerpoint? The slideument is bad and hinders in so many ways. Isn’t it obvious or are they oblivious? At times I wonder if I am a little too invested and unable to see further than bulletpoints. I hope not. My passion is for folks to communicate effectively. It stems from my sadness at seeing wise people, enthusiastic teachers, passionate managers and insightful researchers deliver their information in a way that simply falls short. Their aim is to educate, enthuse, change or stimulate but they could be so much more effective, more engaging, more memorable if they were open to change. Powerpoint, in the way that it is currently used as a slideument, is a significant limitation to effective communication. 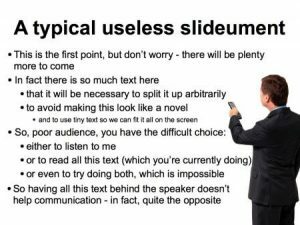 The reality is that people, clever people, great teachers, effective managers, brilliant researchers don’t actually realise how much better their presentations could be without the sea anchor drag they add by using powerpoint as they do. They are oblivious. So, the challenge remains, the opportunities exist and the future is brighter. Keep sharing and encouraging and being the example we seek and things will get better. If you have seen the difference, be that difference for others.